"The Lean Enterprise," by Trevor Owens and Obie Fernandez, covers how to use the start-up mindset to grow larger organizations. The book merges the innovative mindset of start-ups with the established infrastructure of large corporations to increase efficiency and returns. 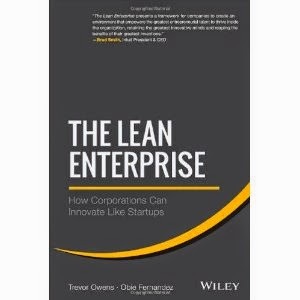 "The Lean Enterprise" really runs the gamut, covering everything from acquisition strategy to how to incubate projects. The book is organized with lots of bold subtitles and small sections to keep the material organized and easy to read. I also like that the authors include real-world examples, such as Twitter's acquisition of Vine, which helps the reader solidify the ideas. I'd say this is a recommended read for anyone who is interested in applying the start-up ideas and methodologies to their business practices.